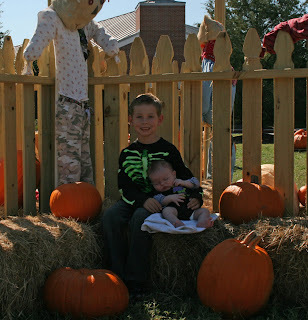 Today, we met up with Melanie and Matthew and took the boys to the pumpkin patch. It was so bright that Denver wasn't a big fan of being in the sun, but we were able to get a few pictures. Denver had to eat before we did anything then he went right to sleep. Matt was so sweet with him and tried to hold him up but he was so afraid he would "break" him. This picture literally makes me laugh out loud. One of his feet BARELY touched the hay and he bad a complete meltdown. Definitely not a fan of the hay! A cute one but we couldn't get Matt to look at us or Denver to open his eyes at all because it was so bright. I couldn't resist putting him in that seat! And with daddy! He looks more like his daddy everyday! 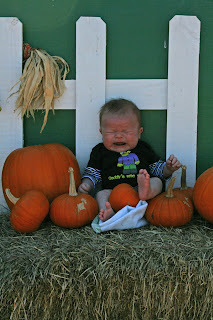 When we were leaving a lady told us "our little girl just turned one on October 1st - just wait until next year and the pumpkin patch will be so much fun. We were in your shoes last year." We can't wait to take them again next year! Getting my freezer ready for a baby!